Indian IT company Infosys said it was increasing its hiring in Indiana from 2,000 to 3,000 workers by 2023. It will also invest $35 million to set up a training center in Indianapolis for U.S. workers. Indian IT company Infosys announced Thursday it would create 1,000 additional jobs in Indiana by the end of 2023, expanding its hiring plan in the state from 2,000 to 3,000 new jobs. The company also said it would make an initial investment of $35 million in Indianapolis to set up a training center for its U.S. workers. Eric Holcomb, governor of Indiana, posted a number of tweets about the news Thursday, from the announcement event where Vice President Mike Pence — who is from Indiana — and Secretary of Labor Alexander Acosta were also present, along with company executives. The training center will have a space of 125,000 square feet, and come up in the 70.5 acres of land that was the old Indianapolis airport terminal. Construction of this first phase of the center will begin in 2018, and likely be completed before the end of 2020, according to Infosys. “We are excited to partner with Indiana to grow our U.S. presence by building our U.S. Education Center here, which is dedicated to continuous learning and incubating the skills of the future. At Infosys, we have always invested in advanced technology and skills and bring deep experience from running the largest corporate training facility in the world. Our new Indianapolis facility will prepare our American employees — and those of our clients — to master the kinds of advanced skills that are now required to succeed in our digital future,” Ravi Kumar, president of Infosys, said in the statement. The corporate training facility he referred to is in Mysore, India, near the Indian IT hub of Bangalore. Infosys employs over 200,000 people across the world, most of them in India. In mid-2016, about 20,000 of its workers were in the United States, of which roughly 4,000 were U.S. citizens. In May 2017, the company announced it would hire 10,000 U.S. citizens over the course of two years, and open four new technology and innovation hubs in the country as well. The hub in Indiana is the first of those four, and was supposed to create 2,000 jobs by 2021, a number which has now been increased to 3,000, while also moving the date for achieving it by another two years. The company is being given over $100 million in incentives and subsidies by the state of Indiana and the city of Indianapolis for the project. Most of Infosys’ existing offices and development centers in the U.S., other than the hubs it announced in 2017, have between 100 and 200 employees. The other three hubs are to come up in Connecticut, North Carolina and Rhode Island. 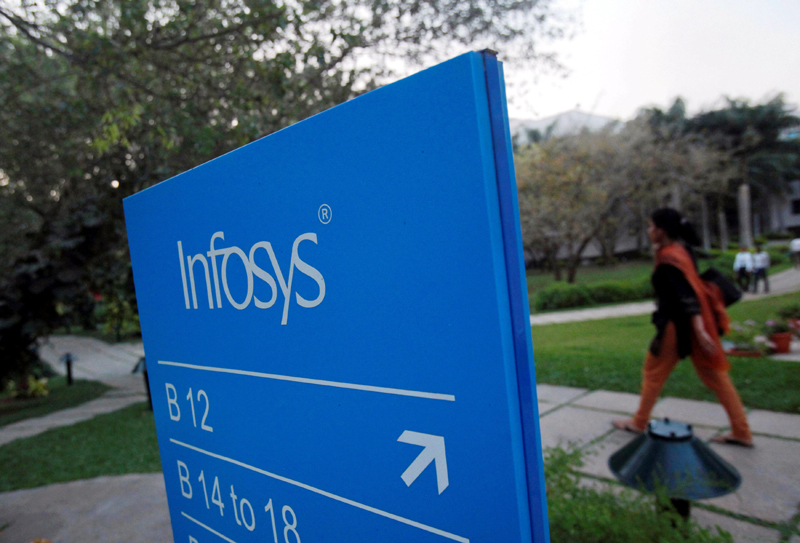 The move by Infosys has been seen by many analysts as placating the Trump administration, which has clamped down on H-1B work visas that companies like Infosys have typically used to staff their U.S. operations with Indian workers. The company says difficulties with the visa program did not influence its decision about its U.S. operations in any way. On the New York Stock Exchange, the Infosys stock closed Thursday trade 1.42 percent higher. Shares of Infosys were trading about 1 percent higher on the National Stock Exchange and the Bombay Stock Exchange in India on Friday afternoon, an hour before closing of trade.